Despite over ten years of trying, and numerous political initiatives at the national and EU level, carbon capture and storage (CCS) has yet to take off in Europe. This failure has variously been blamed on high costs, changeable political backing, public opposition in some countries, and the collapse of the EU’s price on carbon. Whilst all of the above have played a part, it is clear that there is something uniquely challenging about launching an industry which requires an entirely new infrastructure put in place to transport and store CO2. Few companies are willing to invest in this infrastructure without being sure someone will pay them for the service of taking the CO2 of their hands, and no greenhouse gas emitter will pay to capture its CO2 without being sure it has somewhere to go. In economics, this kind of impasse is sometimes known as a coordination failure. The solution so far has been to induce large companies or consortiums to tackle the whole problem at once, but the resulting projects have largely been too complex, and too expensive for governments to back. 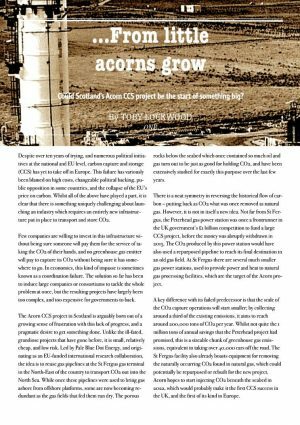 The Acorn CCS project in Scotland is arguably born out of a growing sense of frustration with this lack of progress, and a pragmatic desire to get something done. Unlike the ill-fated, grandiose projects that have gone before, it is small, relatively cheap, and low risk. Led by Pale Blue Dot Energy, and originating as an EU-funded international research collaboration, the idea is to reuse gas pipelines at the St Fergus gas terminal in the North-East of the country to transport CO2 out into the North Sea. While once these pipelines were used to bring gas ashore from offshore platforms, some are now becoming redundant as the gas fields that fed them run dry. The porous rocks below the seabed which once contained so much oil and gas turn out to be just as good for holding CO2, and have been extensively studied for exactly this purpose over the last few years. There is a neat symmetry in reversing the historical flow of carbon – putting back as CO2 what was once removed as natural gas. However, it is not in itself a new idea. Not far from St Fergus, the Peterhead gas power station was once a frontrunner in the UK government’s £1 billion competition to fund a large CCS project, before the money was abruptly withdrawn in 2015. The CO2 produced by this power station would have also used a repurposed pipeline to reach its final destination in an old gas field. At St Fergus there are several much smaller gas power stations, used to provide power and heat to natural gas processing facilities, which are the target of the Acorn project. A key difference with its failed predecessor is that the scale of the CO2 capture operations will start smaller; by collecting around a third of the existing emissions, it aims to reach around 200,000 tons of CO2 per year. Whilst not quite the 1 million tons of annual savings that the Peterhead project had promised, this is a sizeable chunk of greenhouse gas emissions, equivalent to taking over 40,000 cars off the road. The St Fergus facility also already boasts equipment for removing the naturally occurring CO2 found in natural gas, which could potentially be repurposed or rebuilt for the new project. Acorn hopes to start injecting CO2 beneath the seabed in 2022, which would probably make it the first CCS success in the UK, and the first of its kind in Europe. Across the maritime border in Norway, two North Sea gas platforms have been directly reinjecting the CO2 they remove from natural gas since 1996 and 2008, but the connection to onshore emissions is their missing link. As suggested by its name, Acorn’s modest beginnings are intended to be the seed for something much larger. The team envisage receiving CO2 by ship from other parts of the UK, which could conveniently be brought into the deep-water port at Peterhead. In particular, there is a cluster of industrial CO2 emitters in the Teesside area of North-East England which has long been developing CCS plans, but would require substantial new infrastructure to access suitable CO2 storage. 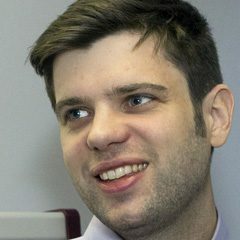 There is also an old gas pipeline running from St Fergus down to the Grangemouth industrial area near Edinburgh, which could be reused to run CO2 emissions back up the country and from there out to sea. This kind of increase in volume is not expected to take place until 2025, and it will eventually require expansion of the offshore operation. With this in mind, there are plans to take on another two redundant offshore pipelines, and use other rock formations in which to store the CO2. An important part of the project’s long-term vision is based on the expectation that hydrogen could become an important source of energy in the UK. This idea is rapidly gaining currency in climate policy worldwide, as the clean-burning gas seems to be one of the only ways in which gas grids could be decarbonised. However, it is also thought that the best way to make large quantities of hydrogen would be from natural gas, with the resulting CO2 emissions stored by a CCS project such as Acorn. Although a complete switch to hydrogen would require some fairly major changes to our gas grid, increasing the proportion of hydrogen to around 10% could be done without too much fuss. The demand for clean hydrogen, and therefore for CCS, could soar in the coming decade. To coincide with an international summit on CCS it hosted in Edinburgh last month, the UK government confirmed £175,000 of investment in Acorn, which will be matched by the Scottish government and will add to the existing EU funding. More good news came in the days around this announcement, as the project secured a licence to operate from the UK’s Oil and Gas Authority, and a CO2 storage lease from Crown Estate Scotland which own the rights to the North Sea assets. Acorn may have timed it right to ride a new wave of favourable policy on CCS in the UK, launched by the technology’s inclusion in the government’s Clean Growth Strategy in 2017, and given further momentum by the high-profile Edinburgh meeting. Whilst sceptics will point out that CCS has been here before in the UK, backers of past projects appear to have learned from the years of failure to come up with something tailor-made to find more favour with policy makers: small, but scalable; low cost, but pioneering. This time just might be different.